How to create and use a customized Visual Studio 2017 project template. This document was updated on September 13, 2017. A well-configured app – web app, or web service – requires a lot of work. Often, you create a new project with the “ASP.NET Web Application” template, with or without an authentication component. Then, you may have to add the Entity Framework. And AutoMapper. And several other components. Next, you create a file for your design model classes. And many others. It would be nice to save all this work as a ‘template’ that you could reuse for new projects. Configure a project with the components and files you want. Do you want to include a database with the template? In Solution Explorer, locate the database in the App_Data folder. You may have to “Show All Files” on the Solution Explorer toolbar. Next, right-click the database item, and choose “Include in Project”. Then, right-click the database item, and choose “Properties”. Change the “Copy to Output Directory” setting to “Copy Always”. Next, on the Visual Studio 2017 “Project” menu, choose “Export Template” to start the wizard. Select “Project template”, and go to the next panel. 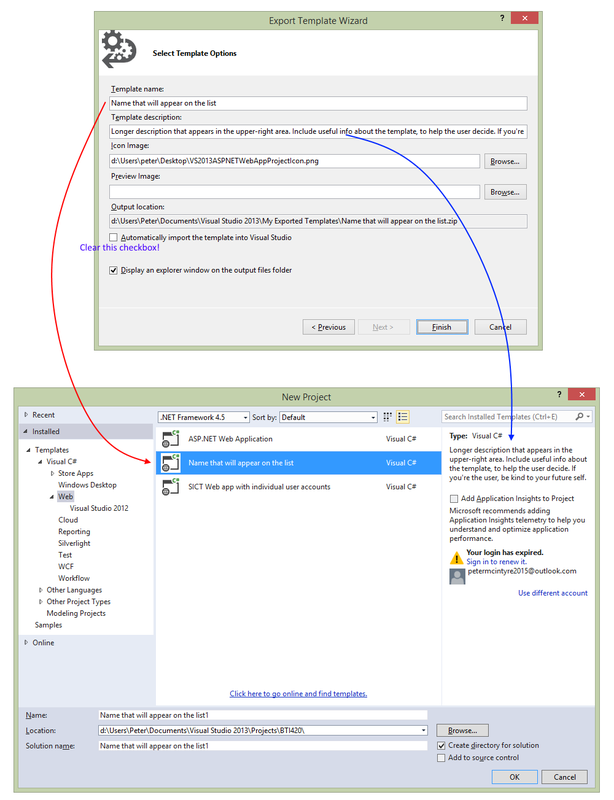 Un-check (clear) the “Automatically import the template into Visual Studio” checkbox. First, use the built-in Windows File Explorer functionality to “Extract All…” to a folder with the same name as the project template. Ensure that you are still in the folder that has Web.config and the .csproj file. Select all the files and folders (Ctrl+A). Right-click one of them, and choose Send to > Compressed (zipped) folder. The name of the zip must be the same as the project template name. Select and copy the zip file that matches the template you just exported. Paste the zip file into this folder. Your new template will now appear when you create a new project in Visual Studio. The image below shows how the wizard values match up to the items in the New Project dialog. Click to view full-size in its own tab/window. Here’s how to update a template. Probably did this in September 2017, but didn’t document it. However, did so in September 2018. Create a new project, based on the previous template.